Leaving aside seven years in Madison, Wisconsin between 1983 and 1990, I have lived within a three hour drive of New York City my entire adult life. Aside from those same seven years, my husband has lived within a three hour drive of New York City his whole life. Traveling to Manhattan from his childhood home in Queens, he watched the construction of the World Trade Center, and two weeks after the 9/11 terrorist attack visited the site of its destruction. The cover of the Summer 2002 issue of MultiCultural Review, which I edited, featured this photo with a tribute by the late MCR writer and poet Zöe Anglesey. I, too, saw the burned out remains of the World Trade Center, where I’d gone once for a passport renewal and another time to see the offices of the Regional Planning Commission for an assignment in an undergraduate urban planning class. After the 9/11 attacks, I remember the messages attached to chain link fences and the walls outside fire and police stations, messages of condolence and solidarity from around the world. Many of those places were no strangers to terrorism and tragedy. Until 9/11 we in the United States had felt insulated and safe. Two world wars had devastated Europe and Asia but barely touched us. The post-WWII wars and deadly civil conflicts in other lands did not affect us — despite our involvement in Vietnam, Chile, El Salvador, Iran, and elsewhere. We sometimes sent messages of solidarity to other peoples, but we were never the recipients of condolences. The messages of sympathy from other lands after 9/11 seemed to me an embrace, a welcoming of this country into a community of people who had suffered but survived. They told us we were resilient, we too would grieve our losses and move forward knowing the whole world was on our side. I found those messages incredibly moving, because they told us we were not alone. The sense of being alone, independent, able to stand up for ourselves and lead others is a large part of the idea of American Exceptionalism, along with the U.S.’s dynamic, relatively unfettered capitalist economy and values of personal liberty and democracy. The events and aftermath of 9/11 challenged that exceptionalism, but at least in New York City, there were positive changes as people started to talk to each other more and help our neighbors. 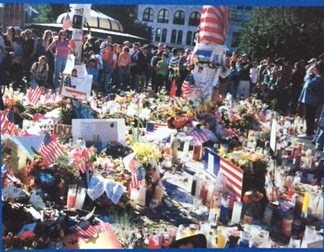 It seemed that people took to heart the messages of caring and love from all over the world. Messages on the wall in the tunnel of the 14th St. subway station between 6th and 7th Aves. Fifteen years later, New York City and the country has endured another cataclysm, one that like 9/11 has shaken us to the core. After we came together against terror and violence, after we elected a Black president and then gave him another term, the pendulum swung. It swung as it had following the social and artistic flowering of Weimar Germany, and the heady early years of the Russian Revolution. Hope and possibility have given way to hatred, fear, and the adulation of brute force. Utopia has become dystopia. The world has reacted with alarm. 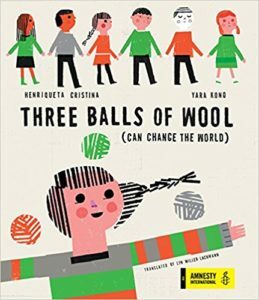 A children’s literature scholar from the UK, where they are grappling with their own groundswell of xenophobia in the form of Brexit, writes, “Sending you all much love in what will be a Time of Trial.” Initially, New York City felt like a safe island of diverse, open-minded people. The night the polls closed, our ordinarily lively neighborhood was as quiet as if a natural disaster had occurred. 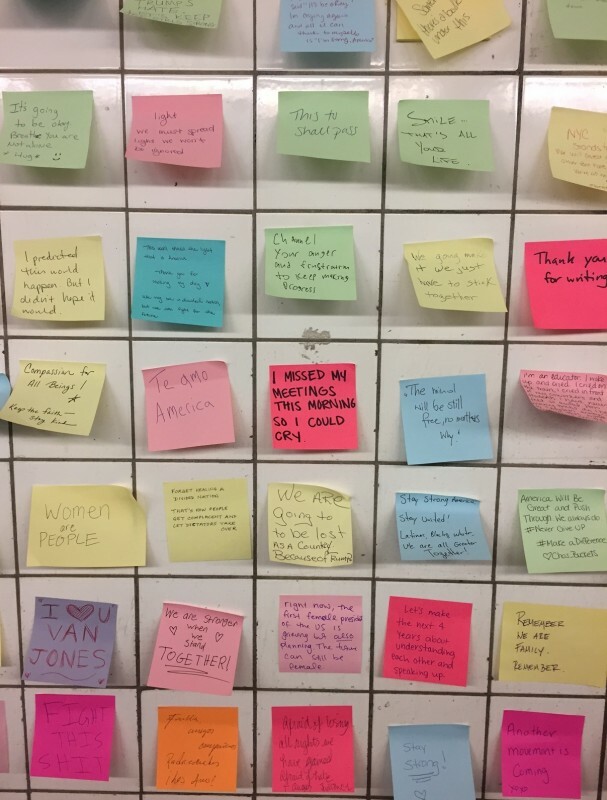 The next day, people began posting messages of reconciliation in the subway tunnel along 14th Street between 6th and 7th Avenues. 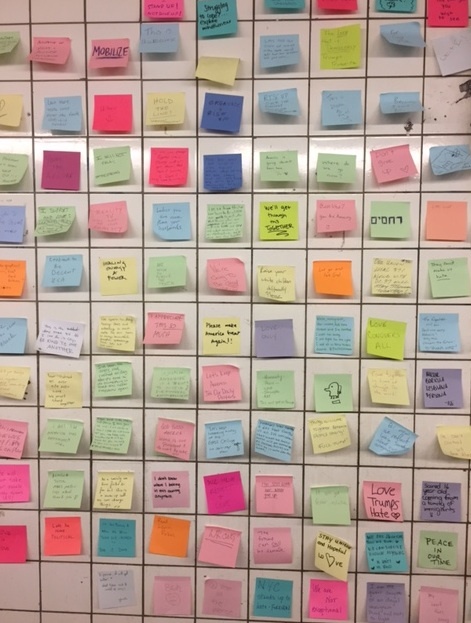 Post-it notes in many colors spread along the walls, New Yorkers telling ourselves that we’d get through this crisis if we stuck together — the same way we did after 9/11. More messages on the wall. Then the hate crimes began, not only in the hinterland, but in the heart of our city as well. Three young Trump supporters beat up a gay man in my neighborhood and ran away. A Hillary supporter in a restaurant in one of Brooklyn’s hippest neighborhoods was discussing her dismay at the election with a woman friend when a Trump supporter struck her in the face and again ran away. Tomorrow I am flying to Atlanta for a conference, and I fear who might be sitting next to me on the plane. No, we are not exceptional. In fact, we never were. Lyn, I am very moved by this exceptional post. Those of us outside your borders are already feeling the toxic fallout from America’s embrace of xenophobia and hatred. Would we could say that this is an isolated reaction in a reactive country! But as we are seeing, global response is equally divided, and I fear for the planet. However, I will hold those bright Post-It flags in my heart as a reminder that the world is still filled with light in a dark time. Thank you for your boldness. Thank you, Amanda! I do hope this scourge doesn’t reach you, and Canada remains a bright spot of human rights action. We’ve read about people in your country who’ve helped to give Syrian refugees new homes, and your country will likely be rewarded for its generosity. I’m writing this on a MacBook Pro computer, which never would have existed (or any other of Apple’s “insanely great” products) were it not for a Syrian immigrant: Steve Jobs’s biological father. While people should never be forced to leave their homes because of war, repression, or famine, immigrants have enriched their new lands since Joseph in the Bible fled to Egypt to escape his jealous brothers in Israel. I’ve also noticed a sad increase in racism in my neck of the woods. But I’ve also experienced the kindness of others. That’s the America we need. I hope more people stand up. There are guides out there for how to show support to someone who’s under attack, including standing near the person and not directly confronting the attacker, who may be armed. In so many ways, this feels like a 1933 redux: after a nation endures economic hardship, an openly racist demagogue gets legal control of a government–after demonizing “the other.” Now it’s up to us to act with courage and civility to prevent the consequences being as dire as they were the last time the world watched this paroxysm take place. I agree. One thing I’ve noticed is that no one seems to be making plans for exile, while in Germany a large number of artists and intellectuals and nearly 10% of the Jewish community (including my husband’s father and aunt, both university students), left the country within a year. If it turns out to be like 1933 (and we really don’t know, though there’s something of a precedent in the US at the end of Reconstruction and the imposition of Jim Crow), some people in the US who are in danger will have to flee and will need help doing so. I am also moved, Lyn. Thank you. It’s time to face this reality. And, yes, Linda and Nanette, this is the time for courage and kindness and action to counterbalance what is coming. Thank you, Sandra! I hope your help won’t be needed, but folks from the US living abroad may be called on to help people in danger if it comes to that. The truth is, we really don’t know what to expect after January 20, 2017, and what the government does officially may be different from what private citizens take on themselves to do.